THIS IS MANCHESTER CITY CENTRE seen from Salford on the afternoon of Sunday 28 May 2000. Soon this view will be hidden behind the new Sno World centre which is to be constructed on the site below the viewpoint. On a technical note, this is a composite of 6 photos taken at 2048 x 1536 on the Nikon Coolpix 990 digital camera. The original copy of the file is 8484x1423 pixels, that's 34MB open, 7.8MB on disk, saved at JPEG maximum compression. It can be printed at 42 inches by 7 inches (107x18 cm) - that's three sheets of A4! The web version is of course much smaller. For more information, e-mail info (at) aidan.co.uk. BRIGHT SUNSHINE and huge billowing clouds were seen over Manchester on Sunday 28 May 2000, while other parts of the country had rain and flooding. 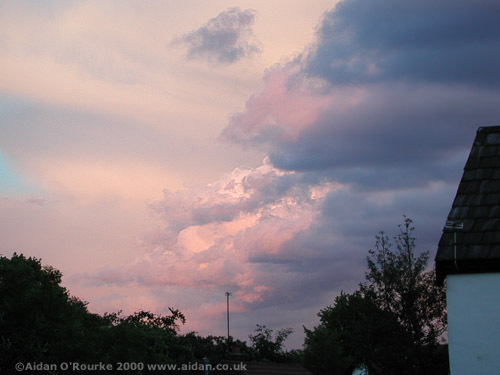 At dusk, I saw these clouds over south Mancheste moving slowly by, coloured pink by the setting sun. People often complain about how bad the weather is in Manchester, but they rarely acknowledge when the weather is good. 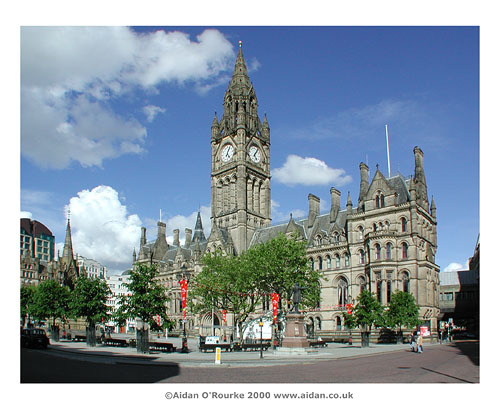 MANCHESTER TOWN HALL, home of the City of Manchester local authority, is a superb example of Victorian neo-Gothic architecture, and is over 120 years old. It looks great in bright sunshine, as here Sunday 28 May 2000, though up till cleaning in the late 1960's it was covered in soot and grime. ROCK LIGHTHOUSE stands on the north western tip of Cheshire (in its ancient county boundaries), at the mouth of the River Mersey. From this viewpoint, on New Brighton promenade, I saw a range of vessels coming in and out of Liverpool, from the Isle of Man sea cat to a giant container vessel. On the other side of the estuary we can see the Port of Liverpool - now one of the busiest in the UK - using giant cranes a few men can load and unload super-freighters, giving turnaround times of less than 24 hours. A recent addition is this set of wind turbines, which face south west, looking towards the north Wales coast. THE MARKETS SHOPPING CENTRE is the focal point of Wigan town centre. 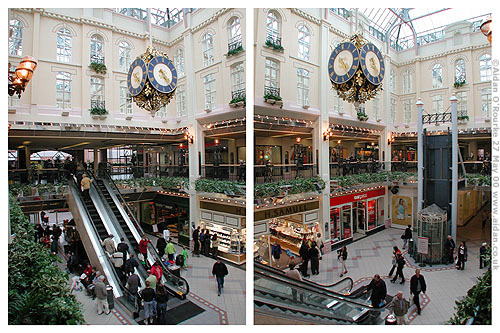 Like many recently-built town shopping centres, it's designed in 'traditional-contemporary' style, with a return to old-fashioned features such as windows, sloping roofs, ornamentation and brickwork. This style seems to be regarded as too backward-looking by Manchester city centre planners, who prefer a more futuristic 'Millennium/ET type of design. On the ground floor we can see two familiar names from the UK high street - H Samuel jewellers and Our Price records. STREETS AHEAD is an annual festival which has taken place each year from 1995 to 2000. Unfortunately, the 2000 festival is the last one. Street performers entertain people at festivals held in town centres all over Greater Manchester. 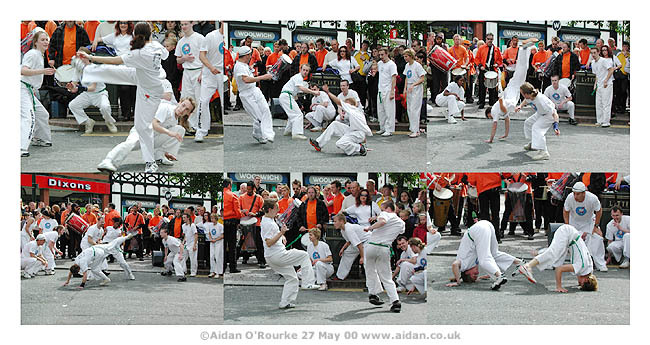 Here we see dance troupe Capoeira Norte on the Market Place, Wigan. The style of dancing is a blend of African and Brazilian, performed to a loud percussion backing.